The UK is being urged to flex its green fingers and put on a nationwide show of gardening colour for London 2012. "Garden for the Games" is a new initiative to encourage people to plant flowers and vegetables in Olympic hues. London 2012 organisers Locog hope friends, family and neighbourhoods will get together to help the scheme bloom. They are asking people to "grow for gold" with window boxes of marigolds, beds of red, white and blue flowers and vibrant veg patch varieties. 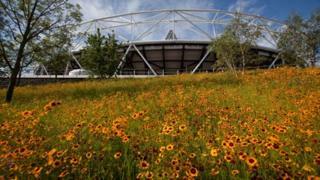 As part of the scheme, garden enthusiasts can also learn how to grow wildflowers like the golden meadows that will surround the Olympic Stadium. Gardening expert Phil Turvil from Coventry has put togethera list of 12 vegetables[pdf] in London 2012 colours, which he said people can grow to be part of the Games. "Food unites people," he said. "I've launched networks in London and country-wide where people can volunteer to help others grow veg and it really does work. "There is a lot of energy and excitement for vegetable and flowers and we're all building on an established heritage in Britain." His list of vegetables take in the blue, pink, yellow, purple, orange, and green colours of London 2012's branding. They include the blue cornflower, pink chard, yellow courgette, beetroot, orange nasturtium (which has edible flowers) and lettuce. Mr Turvil, who is one of Locog's "Local Leaders", said that it's not too late to plant vegetables in time for the Games. "You can get them from a local nursery and many local shops sell them. You don't have to spend very much on them. "March and April is a great time to start sowing and the vast majority are ready to harvest in July. It is entirely feasible on a calendar level and plants like lettuce are very easy to look after. "But the programme is designed for inspiration. We didn't want it to be too prescriptive. It's a starting point for ideas. You can find your own veg, find your own colours and grow what you like to eat." London 2012 is also encouraging people to take part in Garden for the Games by planting flowers in the shape of Olympic rings in Team GB colours and growing marigolds for when the Olympic Torch arrives in local areas. Chairman Seb Coe said: "We are a nation of gardeners and this is as an opportunity to get people together to brighten up their area and build on our proud gardening heritage." Keith Brignall is the Local Leader from Portesham in Dorset where they are lining the streets with marigolds. His job is to coordinate the villagers and get them to decide on how to welcome the Olympic Torch when it passes through. "Locog are asking us to line the streets with gold and that's what we'll do," the retired foreign exchange trader said. "We've had a great response and the villagers are all looking forward to the torch coming. It's a once in a lifetime opportunity. The whole village has come together to make this work."